Remember Andrew Stephens? Several weeks ago he shared his thoughts on sailing and the dream journey he embarked on traveling solo around the world. 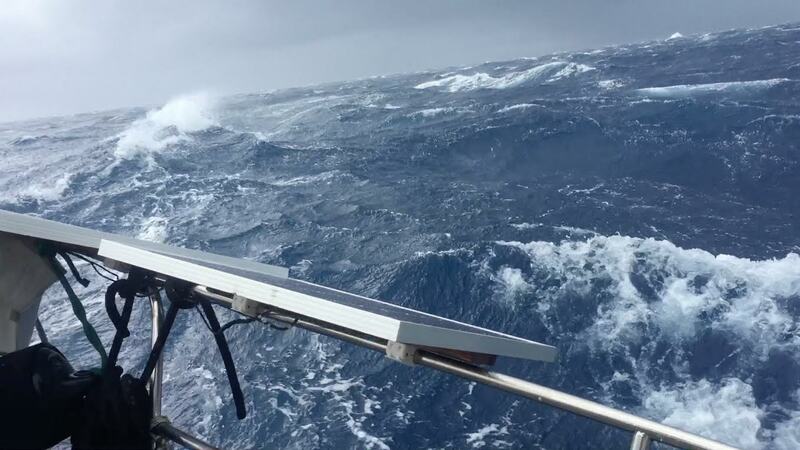 Recently, we stumbled upon Andrew’s exciting video depicting a harsh storm in the South China Sea and asked him to tell more about this encounter. Lucky for us, he agreed to share the story behind this horrifying moment and some reflections on the fear at sea. “I’m often asked “Are you afraid to be sailing around the world alone?”. Without hesitation I always reply, “Absolutely!”. This takes most by surprise as I feel most are expecting an answer that instills confidence or reassures them that all is well on my passages across the high seas. Yet, as most sailors know, the sea is indifferent to your expertise or knowledge, as she will humble even the most “salty” of sailors who believe otherwise. I will be the first to admit that I am frightened every time I point Cascadia’s bow West over the horizon. But, fear is a healthy emotion to have when traveling into a world of the unknown. There are so many things that could go wrong, that it is a wonder how things can ever go right, but rest assured they often do. Yet, there are also those days that do go wrong, and remind you that whether you are sailing across a lake or the Pacific; fear is a healthy emotion to have in an otherwise delightful pastime. Last week I experienced one of those “days” on my solo crossing of the South China Sea. It was on day three, roughly 200 miles offshore the island of Borneo when the winds started to pick up early in the morning. A rather pleasant surprise as the forecast called for a painfully slow 5-10 knots the whole passage. By late morning the winds had stiffened to what I presume were around 20 knots, gusting to 25; I had reduced my sail area accordingly. We were on a beam reach plowing through the water at a brisk 6 knot clip, an impressive feat for this old 30 foot, full-keeled boat. However, the winds steadily increased and by noon, what was once a pleasant morning had given way to anxiety and concern. But before I could react…Boom! Cascadia was slammed on her broadside, rolling violently to port, so much so, that her boom dipped into the water and everything that was once stowed on the starboard side of the boat found its new resting place on the saloon floor. I quickly leapt behind the helm and institutionally put Cascadia on a course downwind. My only thought was to get control of Cascadia, at least for a short while until I could figure out what would be the best course of action. However, our new course offered us little relief as the winds quickly picked up to a velocity like I had never experienced. Heading downwind, I was looking back over my shoulder in absolute terror as a wall of white came screaming towards the stern of Cascadia. The wind was so violent, water was being ripped from the surface and hurled in the direction of Cascadia. It caused me to shield my face with one arm as I gripped the helm with the other. Although I was deeply reefed, it was still too much sail and I was using all the rudder I could to keep her on course. Soon thereafter, the seas steepened to the point where they were breaking across her stern. Some of the waves would land in the cockpit, but most simply heaved Cascadia effortlessly down the face of each wave, surfing into the trough where she was to only be met by the next wave. Thank you Andrew very much for sharing this and good luck with your future adventures! Stay safe! Read more about Andrew on his blog. We are Harba and we are here to make your life easier. 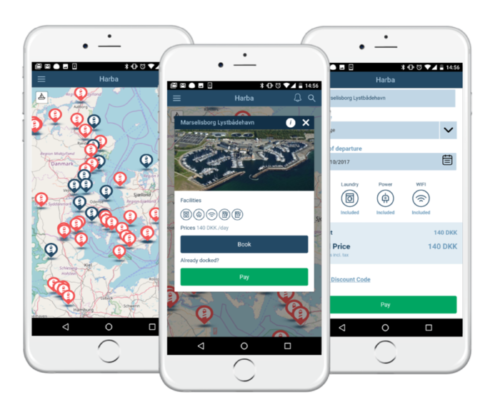 We have developed an app that allows you to easily reserve and pay for a berth or mooring in advance. And guess what? It doesn’t cost you a dime. Get the Harba app for free today: Download on App Store or get it on Google Play – We are coming to a harbour near you! For more information, please visit our website at harba.co.